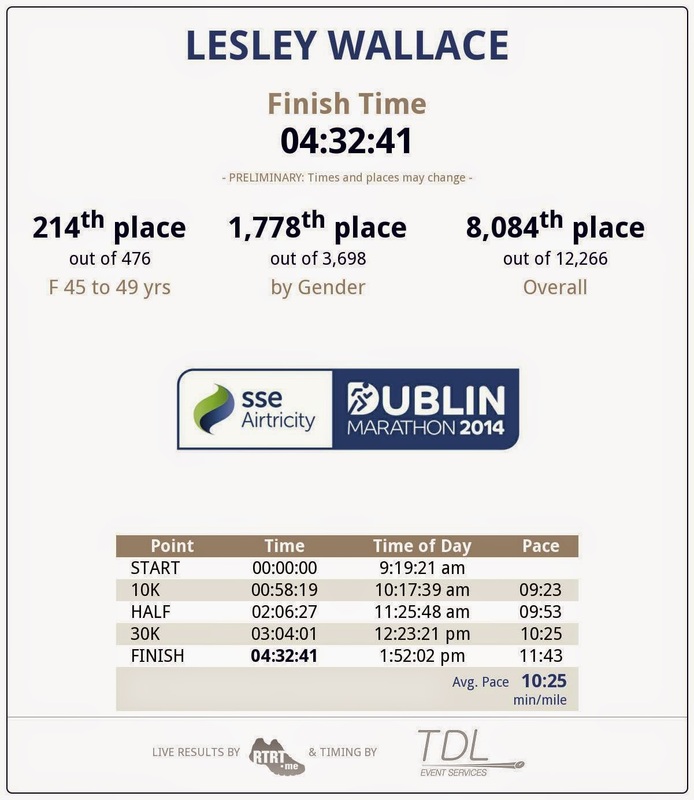 On Monday 27th October 2014 I ran in the Dublin Marathon. This was a Bank Holiday in Ireland. We left our hometown of Kendal at 9.30am on Saturday 25th October to head to Manchester Airport. We arrived at our hotel(The Jurys Inn, Christchurch) at approximately 3.45pm and had to rush straight back out to collect my race number from the RDS centre before it closed at 6pm. 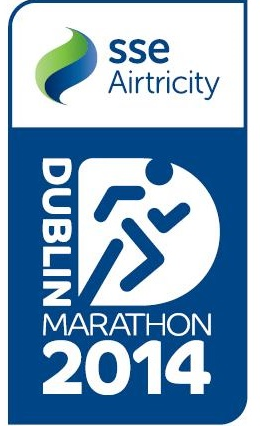 We had booked the hotel because it was in close proximity to the Marathon's start and finish points, so I felt rather irritated to discover that the RDS centre was in fact a 3 mile journey away. Being a visitor to the city and being unfamiliar with the bus routes and stops this caused us a lot of undue stress. After locating the correct bus stop we waited patiently together with what felt like half of Dublin for the correct bus to arrive. When it arrived we managed to squeeze on (only just) but had the problem of knowing where to get off to be close to the RDS centre. As the bus was full to overflowing we were stood right at the front and we had a friendly bus driver who thankfully told us when to get off. With traffic congestion this "short" journey took us just under an hour! If I hadn't been running a marathon the next day I would have walked back into town rather than suffer another similar journey. We arrived at the RDS Centre just after 5pm and things went from bad to worse. The queue for number collection was right out the door and down the street. We didn't have any choice but to join the end of the queue! We thought we just had to get to the main doors and we would be sorted but alas once inside the building the queue snaked upstairs and right around the building and back again! I finally got my number and goody bag but didn't have the time, energy or inclination to stay and have a good look around the expo knowing we had to fight the crowds on the bus again to get back to the hotel! Finally at 6.30pm, 2 and a half hours after leaving the hotel we arrived back not in a very positive frame of mind! What I don't understand is why don't the race organisers either post out the race numbers or if this is a cost saving exercise at least have a number collection point which is close to the race start! In preparation for the marathon and to carb up we went out to an Italian restaurant and had a fabulous meal, before heading to bed for an early night! I had the worst night sleep ever as the radiator in our hotel room clunked and banged every 10 minutes and the other rooms on our floor were home to a very loud, boisterous and over excited group of girls on a hen night with obviously no regard to anyone else. I was thankful when my alarm went off at 7am and I could get up! I struggled with a porridge pot and a banana for breakfast and then my husband did his physio bit and put some KT tape on my Achilles. I had an Achilles injury last year and as I increased the mileage heading towards the marathon they started to object slightly and were becoming increasingly sore. I wanted to give them a bit of support and hoped the tape would do the job! This was beginning to look like all the ingredient's for a disastrous marathon! Luckily the weather appeared to be on side - at least it wasn't raining! After contemplating the weather I dressed appropriately and we were heading out to the race start by 8am. On our way out we complained to the hotel reception about our room and they gave us the option of moving rooms which we accepted. However, this meant packing ... thankfully whilst I was running my husband turned from physio to porter and it was all done by the time I finished! The walk to the start only took us about 15 minutes. Unfortunately my husband and friends who had come to support me couldn't actually join me at the start as it was for competitor's only. We said our goodbyes and I headed off on the lonely walk to find the green start point. At this point I wished I had brought a running friend for company! I passed through the baggage area and seeing some portoloos decided to get my nervous wee out the way and joined the queue. After I had been queuing 5 minutes or so there was an announcement which said "Please do not queue for the toilets in the baggage area as there is plenty more toilets in each starting zone". After receiving this information I continued on my way to my starting zone and was dismayed to find the longest toilet queue in the world queuing for just 10 toilets! Where were the plentiful supply of toilets the kind lady on the loudspeaker promised? I arrived in this mega queue at 8.30am and actually missed my green start at 9.10! Thankfully I made it in time to start with the last zone and managed to shuffle and wheedle my way to the front. I was not a happy bunny but tried to remain calm. At the front of this zone were the 4.20 pacers and as my PB is 4:21 I thought if I stayed with them I would get a PB by a marginal amount. We were walked to the start line before a countdown had us on our way at around 9.20am! The area around the pacers was too congested so I decided to run my own race! Once I broke free of the pacers it was great - no problems with settling into my pace at all. It's just a pity that my pace was just too fast! I was delighted to see my friends and husband at the 3 mile mark together with a support banner that made me laugh! My first mile was at a 9.01 minute mile pace, mile 2 at a 8.46 minute mile pace and mile 3 was at a 8.56 minute mile pace before I managed to rein myself in and I eventually slowed down to a 9.44 minute mile pace for mile 4. I then managed to maintain a fairly consistent pace with mile 5 and 6 also being at a 9.44 minute mile pace. I continued with 9.53, 9.26, 9.18, 9.36, 9.58, 10.10, 9.52, 10.16. At this stage in the race I was approaching the half way point and I crossed the timing mat in 2 hours 6 minutes right on schedule for a PB! Now all I had to do was maintain this pace! The first half of the course had been surprisingly undulating and the weather was very warm, humid and windy! Not a good combination but on a positive note my Achilles were behaving themselves and I had absolutely no pain despite the hills! The crowd support was amazing and there were lots of banners offering support as well as kids high-5ing and sweets galore! One banner that really struck me said "I am so proud of you complete stranger" and it brought a tear to my eye! So many people were shouting my name as I ran I felt like I had 1001 friends with me! It is a truly amazing city! Despite my best efforts I slowed down during the second half. With it being such a warm day I had purposefully kept well hydrated and took an energy gel every 5 miles but this wasn't enough to keep the dreaded wall at bay! At mile 21 I hit it head on and by mile 22 I was walking! I have never walked in my previous 2 marathons and I was upset and disappointed with myself but my legs just wouldn't listen! After a short walk rest and with lots of encouragement from the crowds I managed to get going again but the low point came when the 4.20 pacers passed me at the 23 mile mark. My heart just completely lost it! I was hot, I was tired, the wind was making its presence known, I was struggling up a hill and now a PB was out the window. What was the point? With this defeatist attitude I ran/walked/shuffled the last 3 miles and they felt longer and harder than the first 23 miles! Thankfully the tape on my Achilles had worked so at least I wasn't in pain too! The crowds on the final stretch were amazing and I tried my best to give it my all! Once over the finish line I stopped my Garmin and despite seeing 4:32:44 I really didn't care! I had finished! I had crossed the line! Although my Garmin did say I had run 26.37 miles - perhaps I did too much zig zagging trying to high 5 everyone! You can see the route and my race stats here! Before the race I had announced to family, friends and anyone who would listen that this was my third and final marathon and I felt a huge relief that I would never have to do it again! I made my way to the medal bearers and collected my goody bag and T shirt before heading to the family reunion point where I had arranged to meet my husband and friends! The crowds were thick and everyone was trying to move in different directions! I was relieved to finally make it! After reading this race report you may think I had a very negative experience but I have got to say as far as marathons go this is an absolutely fantastic race and one I would whole heartedly recommend! The race number collection point and the start and finish facilities need improving but the actual race itself is great, the crowd support fantastic and the water, Lucozade and gel stations are outstanding! What's more I have NEVER received 2 goody bags before - I got one with my number and it included a towel and one at the finish! This truly is an amazing marathon and I would definitely call it the friendliest most supported marathon out there! 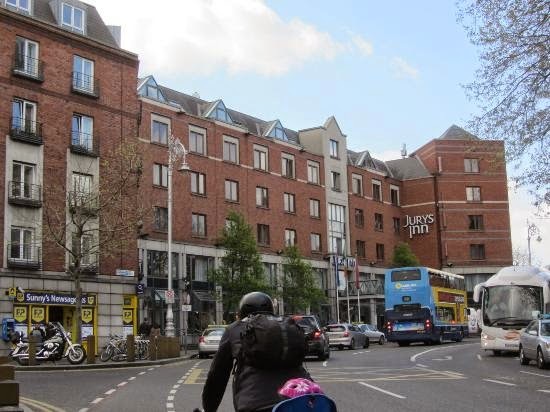 Dubliners did the city proud! I would recommend it 100 per cent! If anywhere was going to entice me to do another gruelling 26.2 miles - it would be Dublin and the partying experience afterwards was worth the pain! I am very pleased that I stayed for 3 nights in total, which meant 2 nights of fun and frolicks! I even wore my medal to go out - I was indeed a very proud finisher! 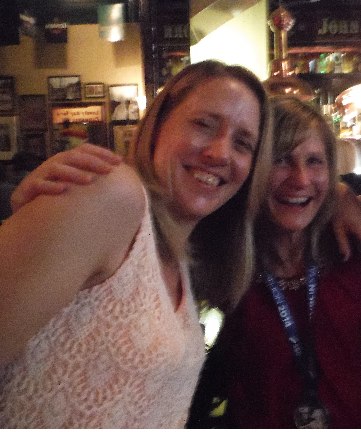 Thank you Dublin for a memorable few days! I didn't get the longed for PB but the overall experience was worth far more!